I’m not exactly sure how Round 18 of the A-League could possibly live up to the drama and the goal fest that was Round 17, but let’s hope the players give it their best shot. On paper, this looks the toughest tipping round of the season thus far, with each and every team a real chance to take all three points. Without further ado, here are the panel’s thoughts on five compelling and important matches for all ten clubs: whether they currently sit on the lofty rungs of the ladder or in the cellar, there is much at stake. Be sure to insert your tips into the sheet below and have a say in the ever growing voice of the crowd. The interaction has been amazing this season with hundreds of tipping entries each week keeping the experts chasing the coat tails of the knowledgeable A-League community. The Jets finally clicked into gear last Friday night, and there’s no reason to suspect the winning run can’t continue at home to the Phoenix, especially since Ernie Merrick always seems to hold a particular grudge against his former clubs. 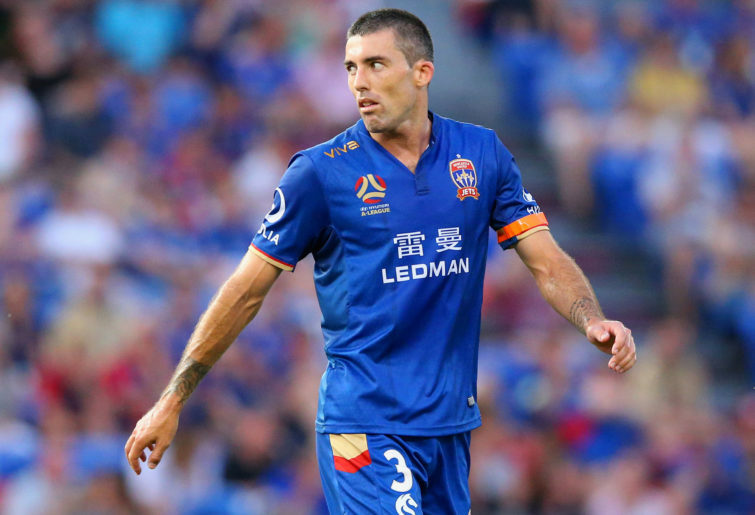 No Jamie Young is a problem for Brisbane Roar, and although they’ve been nowhere near as bad as their points tally suggests this season, it’s hard to see anything but a Sky Blues victory at Suncorp Stadium. What’s that? The Central Coast Mariners favourites to win a game? It’s now or never for the Gosford outfit, and while the Wanderers aren’t necessarily the worst team in the league, they look like they’re about to get beaten by them. The sight of Marco Kurz running down the touchline, fist-pumping in front of the Melbourne City fans and roaring in Warren Joyce’s face as the City manager stands emotionless on the touchline, is something we all need to see. So… Adelaide to win then? The game of the season, let alone the round, and also the toughest one to pick. Glory are the A-League’s team to beat, but that’s exactly what might happen here. Victory at home in front of their parochial supporters on a Sunday afternoon may well just hand them the edge. Perth Glory did a number of the Phoenix last week and but for some goal keeping heroics, the 3-0 score line may have been even more convincing. Is it the end for Wellington? Certainly not. However, the Jets are playing knockout football for the next ten weeks and off the back of a good away win against the Wanderers in Sydney last week, I think they can back it up with another. If the home fans rally, this could be the start of something for the Novocastrians. I hesitated over the keys for some reason as I pondered the Roar vs Sydney clash. Why, I’m not sure. Everything suggests that Sydney will ride into Brisbane and take all three against a Roar side that are finding unthinkable ways to lose matches. Last week’s capitulation in Adelaide spoke volumes of where they are at both mentally and emotionally. The Sky Blues by four clear goals. The Wanderers and the Mariners might just put on the best show of the weekend. There is nothing to lose here and a wooden spoon to avoid. If the Mariners do indeed win this one, which I believe they can, the relegation battle will heat right up. Oh……that’s right. In another line ball game, City host Adelaide at AAMI Park and something tells me this might get a little fiery. It looks a City win to me, bouncing back after some poor losses where they have looked attackingly inept. Much will be expected of Jamie Maclaren and his potential inclusion may mark a turning point in City’s season. Adelaide are doing little wrong except starting slowly in matches. This battle between fourth and fifth looks a tasty one. Victory and Glory do battle to round out the weekend and as first and second on the ladder, bragging rights will be well and truly on offer. The home advantage could be the kicker in this one. With Ola Toivonen back in and the Victory front line scoring heavily, it is tough to see them losing on their home patch. However, Perth are scoring just as consistently and did make a real statement with a comfortable win against Wellington last week. Diego Castro could be the key for the visitors and Andy Keogh and Chris Ikonomidis may be the beneficiaries. Despite Round 17 being filled with ebullient football, the results were quite predictable – even I managed to pick up a few points. This week’s round looks much harder. Newcastle need to be swabbed after last week. What happened to Dimi Petratos, Roy O’Donovan and co? Where did that performance come from? It harked back to the days of, well, last year, when Newcastle’s combinations were the envy of the league. Wellington Phoenix will be licking their Glory-inflicted wounds and another away trip might be telling. Jets to win. I hope Brisbane wear their swish maroon kit against Sydney FC. They’ll need all the help they can get with that morale-crushing defeat against Adelaide weighing on their minds. The Sky Blues were efficient without being spectacular last week but coach Steve Corica will be buoyed by good performances from Rhyan Grant and goalkeeper Andrew Redmayne. Sydney to repeat last week’s 2-0 score line. Western Sydney Wanderers have now lost six home matches in a row. The new stadium can’t be built quick enough. Rumours have it that coach Markus Babbel has been seen with a trowel laying some of the bricks. The good news is that the Wanderers’ last home win was against this week’s opponents, Central Coast Mariners. The Mariners are improving but statistically speaking, tipping them to win is for mugs. I’ll sit on the fence – draw. The Melbourne City versus Adelaide game is harder to pick than a troll’s nose (yes, a Harry Potter reference). It would seem that Jamie Maclaren is the player City need but re-adjusting to the A-League may take a few weeks. I can’t separate these teams. The Sunday afternoon match between Melbourne Victory and Perth should be a cracker. Glory showed their class in their 3-0 win over Wellington. Can they turn it on in Melbourne against a Victory side boasting such in form players as James Troisi, Kosta Barbarousses and Terry Antonis? I don’t think so. Melbourne might sneak this one and even up the premiership race.